347 pages | 36 Color Illus. | 176 B/W Illus. Thus, Electrolytes for Electrochemical Supercapacitors is a valuable resource for the research and development activities of academic researchers, graduate/undergraduate students, industry professionals, and manufacturers of electrode/electrolyte systems and electrochemical energy devices such as batteries, as well as for end users of the technology. "… provides a nice overview of both the fundamentals of electrochemical capacitor technologies and some of the latest and most impactful publications on electrochemical interactions between electrolytes and various electrode materials. … discusses technologically important but often omitted topics related to the impacts of binders and oxidation stability of current collectors utilized in the construction of supercapacitor electrodes." "… excellent, up-to-date information on electrolytes for electrochemical supercapacitors. A must read for anyone working in this area." 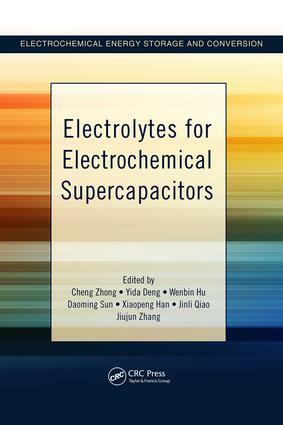 "… comprehensively summarizes electrolyte aspects in supercapacitor research and development. … [includes] a good selection of topics covering all aspects that a researcher would wonder. … The editors are leading scientists in this area." "… very useful for graduate students and also for researchers in the field of electrochemical supercapacitors." "The major strength of this book is the topic by itself—electrolyte material—since it is not often detailed in other similar books, which are mainly focused onto the active material part (carbon, oxide, etc.). … In chapter three, interesting information about the corrosion of aluminum current collectors can be found, which is really important and often neglected or disregarded in our community. The book also contains, in chapter one, an updated view of the latest developments on porous carbons as well as on pseudocapacitive materials, which is useful." Cheng Zhong is an associate professor in the School of Materials Science and Engineering at Tianjin University. Prior to joining the faculty at Tianjin University, he worked as an associate professor in the State Key Laboratory of Metal Matrix Composites in the Department of Materials Science and Engineering at Shanghai Jiao Tong University. He earned his BSc and PhD in Materials Science from Fudan University in 2004 and 2009, respectively. Dr. Zhong’s recent research interests focus on the development of electrochemical metallurgy methods for preparing micro/nanostructured materials for electrochemical and electrocatalysis applications. Yida Deng is a professor in the School of Materials Science and Engineering at Tianjin University. He earned his PhD from Shanghai Jiao Tong University in 2006. Dr. Deng’s research interests include metal and metal oxide nanostructures for electrochemical and energy applications. Wenbin Hu is a professor and dean of the School of Materials Science and Engineering at Tianjin University. Previously, he worked as a professor in the Department of Materials Science and Engineering at Shanghai Jiao Tong University. He holds a BSc and PhD from Central-South University and an MSc from Tianjin University. Dr. Hu is a member of the Expert Group on Advanced Structural and Composite Materials in the new materials field of China’s 863 Program (National High-Tech Research and Development Program). He received the support of the National Science Foundation for Distinguished Young Scholars of China in 2011. Dr. Hu’s research interests focus on advanced micro/nanomaterials for energy storage and conversion. Daoming Sun is chief technology officer at LiCeram Electronic Technology Co., Ltd. He earned his PhD in physical electronics from Fudan University and holds a bachelor’s degree in materials science and engineering from Xi’an University of Technology. His research focuses on the development of materials for electrochemical environmental sensors. Dr. Sun worked as a team leader at LiCeram, and he has successfully developed a novel high-sensitive sensor series that detects the time of wetness and corrosion current for the corrosion evaluation of metal. Xiaopeng Han is currently a lecturer in the School of Materials Science and Engineering at Tianjin University. He earned his BSc in chemical engineering and technology from Tianjin University in 2010 and received his PhD in material physics and chemistry from Nankai University in 2015, respectively. Dr. Han’s research interests focus on functional materials with micro/nanostructures for oxygen electrocatalysis and metal-air batteries. Jinli Qiao is a professor, PhD supervisor, and scientific core-competency leader at Donghua University. She earned her PhD in electrochemistry from Yamaguchi University in 2004 before joining Japan’s National Institute of Advanced Industrial Science and Technology as a research scientist. From 2004 to 2008, Dr. Qiao carried out seven fuel cell projects including two New Energy and Industrial Technology Development projects in Japan. From 2008 to the present, she carried out a total of 12 projects funded by the Chinese government. Dr. Qiao has 20+ years of scientific research experience, particularly in the areas of electrochemical material development and energy storage and conversion. Jiujun Zhang is a principal research officer at the National Research Council of Canada, and a fellow of the International Society of Electrochemistry. He earned his BSc and MSc from Peking University and his PhD from Wuhan University, and carried out three terms of postdoctoral research at the California Institute of Technology, York University, and the University of British Columbia. Dr. Zhang holds more than 14 adjunct professorships, has 400+ publications with more than 16,000 citations, and serves as an editor or editorial board member for several international journals as well as for the CRC Press book series on electrochemical energy storage and conversion.